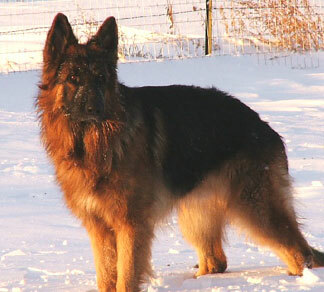 Max is a coated GSD and he is a wonderful friend to me. He loves people, kids, and playing with his big dog buddies. He even tries to play with the small dogs but, they don't seem to understand that he is just 90 lbs of puppy. We hike or go to the dog park everyday. We just got back from a 4 day backpacking trip in Utah's Unitah mountains. He completed his CGC evaluation and passed with ease. I am very lucky in that Max can come to work with me. Which means he is almost never left behind. If I can't take him then I don't go! I have included 2 pictures of him. One at 4 months and the other at 15 months. What a beauty Max is. We own a 4.5 month coated German Shepherd named Tao. It's amazing how much Tao looks like Max at 4 months. Your picture of Max at 15 months has provided us a really good idea what he'll look like at the same age. He keeps us very busy. He's very intelligent and we will begin some basic obedience training in the next couple of weeks. He is very cautious of new people and children, so that is ongoing work in progress for us. He's recently discovered his voice, so he is quite chatting right now, especially when he meets a new furry friend. Interested to exchanging more pictures and stories of Max's progress as we begin our journey too. Where did you get your shepherd from?